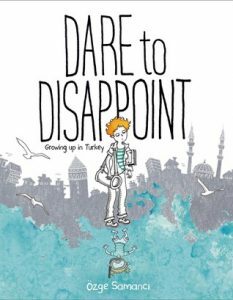 “Dare to Disappoint: Growing Up in Turkey” (Farrar Straus Giroux 2015) by Özge Samanci is an inspiring memoir and a more-than-charming graphic novel. It follows and eventually answers the universal questions: What do I want? Who am I? What’s more, it reveals another culture—a middle eastern culture, a Muslim land—at a time when seeing and understanding others is more important than ever. Özge, was born in the mid-70s in the Aegean coastal town of Izmir. When television arrives in the mid 80s there is one channel. Özge sees an underwater Jacques Cousteau special. She’s smitten. She decides she will become a scuba diver. Her father expects “better” from her. She tries. But there are obstacles. In Turkey the school system makes the attainment of education challenging, especially if you’re not wealthy. There are deep conflicts between secularism and fundamentalism—Darwin or Allah? You watch Özge grow up alongside her smarter, more talented big sister who eventually succeeds in becoming a computer scientist—a prestigious field (although she’s not passionate about it). Özge keeps searching, trying, growing, in spite of these hardships. I love to read stories from outside my culture. You can’t help but compare it to your own. And if you have friends from that other culture, you get to understand and know them better. In this case, you understand why they might be so knowledgeable. In order to get anywhere in the Turkish education system you have to learn how to learn. You must pass tests to get to the next level. Test results also decide to which school you will advance and the quality of teaching you will experience. And you learn about Turkish government and politics. For instance, elementary students in Turkey in the 80s were taught that they should want to die for their former “President” Ataturk, who was actually a dictator (and who died back in 1938). Özge’s father wants her to be an engineer. She tries, but all she is only advanced into the easier field of mathematics. Easier? you ask. (. . . well, I asked). Can Özge please her father? He’s not easily pleased. She hears his voice in her head. It’s so loud, she can’t hear her own voice. And there’s the noise of all those other voices telling her to be: an engineer, lawyer, doctor. Her friends ask her: What are you good at? What do you love? Nothing nothing nothing. Özge falls into a deep depression. What will she do? She tries acting. And fails. Then her friends see her school notes where she’s doodled around the coffee drips, fingerprints, and wrinkles. Thank heavens. You should see them too. Samanci’s artwork is sweet, funny, and smart. So is her text. Because this book is so inspiring, you know you have to give it as a gift!